The human body is home to a multitude of receptors, working to detect and transmit signals from all kinds of stimuli to bring about vital changes. Detection of light in the eyes to allow vision, detection of heat in the environment to allow temperature regulation and detection of pain via sensory receptors in the skin to protect ourselves, are all examples of how receptors allow our bodies to function efficiently. However, receptors aren’t just found near the surface and thus, the stimuli they respond to aren’t just from the external environment. Receptors exist much deeper within the body; an army of which can be found on the surface of the cells comprising our internal organs and tissues. It is through these receptors that communication between cells can occur, to regulate a constant internal environment via the process of homeostasis and additionally regulate the growth and maintenance of our bodies. Figure 1 – The three subclasses of the RTK family and their members. 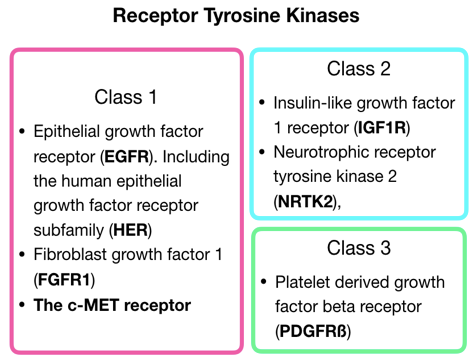 Receptor tyrosine kinases (RTKs) are one family of receptors that can be broken down in to three subclasses, each containing different members of the RTK family (figure 1). Each of these family members, plays a specific role in the vital processes that occur within our body’s cells over our lifetime. Cell proliferation (multiplication of cell number and expansion in size), cellular differentiation (specialisation of cell type), cell survival through metabolic processes, the migration of cells from one site to another and overall control of the cell cycle are all major events controlled by different members of the RTK family (Blume-Jensen and Hunter, 2001). In most cases, the binding of small circulating molecules known as ligands to receptor on the cell surface, initiates a sequence of signals within the cell. 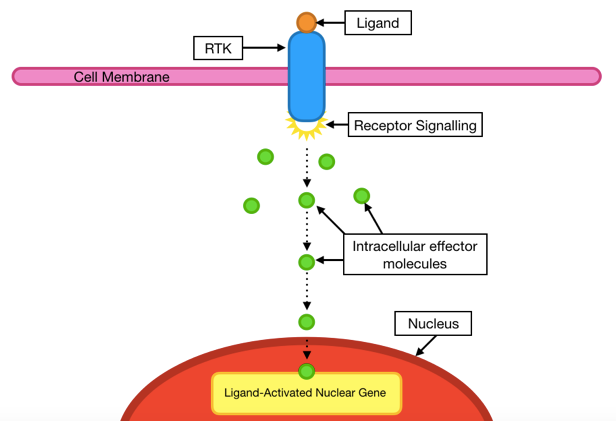 Starting at the cell surface, these signals are then transmitted through the RTK from the environment outside of the cell (extracellular), to that inside the cell (intracellular), where small intracellular ‘effector molecules’ work together to pass these signals on and bring about the required changes for the any of the above cellular processes to occur (Schlessinger, 2000). For example, such changes may be the result of nuclear gene activation (figure 2). As you might expect, with many different subclasses of RTK comes many different sequences of signalling to enable the variety of changes required for growth and maintenance. Such sequences are referred to as ‘signalling cascades’ or ‘signalling pathways’; the enormous variety of which form a complex ‘signalling network’ within the body. So, now that you’re fascinated by this astonishing array of events that occurs under our skin on a daily basis, perhaps you’re also wondering what exactly a ‘tyrosine kinase’ is? The tyrosine kinases are a family of enzymes and critical mediators within signalling cascades. These enzymes catalyse the phosphorylation (addition of a phosphate molecule using Adenosine Triphosphate; ATP) at specific targets found within proteins, called tyrosine residues (Paul and Mukhopadhyay, 2004). In the case of receptor tyrosine kinases, it is first essential to understand their structure, which may also clear up where they got their name. 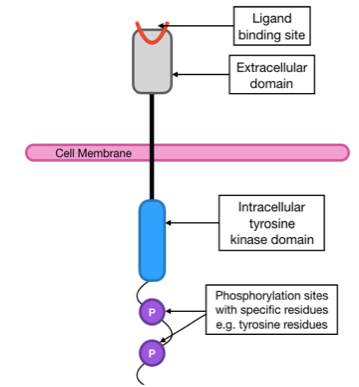 These receptors possess their own tyrosine kinase which can be found in their intracellular domain (figure 3). As illustrated in figure 1, the epithelial growth factor receptors (EGFRs) are a subfamily of RTKs and when found in in humans, are referred to as the human epidermal growth factor receptors, or simply, the ‘HER family’. This particular family of RTK has four members; HER1, HER2, HER3 and HER4, of which HER1 and HER4 operate via the standard RTK signalling mechanism explored in figure 2. However, unlike the other two members of this family, HER2 and HER3 possess structural limitations. HER3 lacks a functioning tyrosine kinase on the intracellular domain and thus, intracellular events cannot occur. On the other hand, HER2 lacks an open binding site on the extracellular domain and as a consequence, ligand binding cannot initiate signalling cascades (Arkhipov et al., 2013) (figure 4). It is these two features however, that link us back to the formation of receptor dimers in the process of dimerization, where it gets even more clever. Via dimerization of HER2 with HER3, the lack of binding site on HER2 is overcome by the one provided by HER3. Additionally, the non-functional tyrosine kinase domain of HER3 is counteracted by the functional one of HER2 (figure 5). Just as HER2-HER3 dimers can form, all members of this family may pair with a different member of the HER family. When the two receptors in a dimer are different, this is referred to as a heterodimer. By contrast, when two of the same HERs pair up, this is called a homodimer. It is important to consider that due to the structural limitations of HER2 and HER3, homodimers of these receptors do not permit successful signal activation (Arkhipov et al., 2013) (figure 5). So now we know how HER signalling works; from ligand binding to signal initiation and transmission, to the work of effector molecules. Additionally, we are now also wise to the HER family dimers that can occur for successful signalling. From here on however, we shall focus solely on HER2, due to its significant contributions in the development of human cancer. HER2 and Cancer; What Happens When Things Go Wrong? Being a type of EGFR, HER2 plays a key role in the cellular differentiation and growth of epidermal tissues and is subsequently found in many locations across the body. Taking this into consideration, alongside our newfound knowledge of how fundamental signalling cascades work, it is probably unsurprising that when regulation of HER2 signalling goes wrong, there are catastrophic consequences. 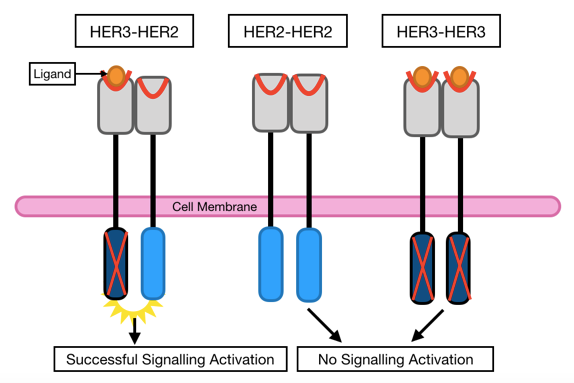 When the level of signalling via HER2 increases as a result of deregulation, uncontrolled cell growth occurs. There are several ways in which HER2 deregulation can happen and lead to the development of cancers; a particularly predominant one being an increase in the number of HER2 gene copies in the nucleus of a cell, causing it to become cancerous. Gene amplification is commonly implemented in the development of several HER2-expressing cancers such as lung, prostate and oesophageal cancer but is particularly prevalent and well-studied in breast cancer (Normanno et al., 2006). This overexpression of HER2 occurs in about 25% of all breast cancers and is referred to as HER2 positive cancer (Xu et al., 2017). Figure 6 – HER2 overexpression due to increased gene copy number; receptor/gene copy number not to scale (an adaptation of ©whathealth.com, 2018). In these cases, the cells of a tumour may contain as many as 50 HER2 gene copies. These genes encode the information required for cell machinery to produce HER2 and consequently, the multiplication of gene copies enables potential for an increased number of receptors at the cell surface by as much as 100 times (Moasser, 2007). To put this into perspective, the surface of a healthy cell has around 20,000 HER2, however in a cell with HER2 gene amplification, as many as 2 million can be found (figure 6). Taking a moment to consider the signalling, a good analogy may be to compare the new level of activity to the London underground in the peak of rush hour; something nobody wants to be caught in the middle of! So what can be done to combat this detrimental problem? Over the last four decades, extensive study has revealed the crucial steps in HER2 signalling, providing a level of understanding sufficient for the exploitation of such mechanisms, with drugs known as targeted cancer therapies. So I imagine now you’re thinking, what is a targeted cancer therapy? Well let’s take a look. For many years, cancer was treated with conventional chemotherapeutic agents; drugs such as paclitaxel, that target and destroy all rapidly dividing cells. However, the problem presented here is that there are many healthy cells in the body that rapidly divide, such as those in our immune system or those that form our hair, the latter explaining the loss of hair seen in cancer patients. Aiming to provide a treatment that avoids the killing of healthy cells, the development of targeted cancer therapies emerged; drugs that specifically target cancer cells to inhibit the RTK signalling networks and decrease the levels of signalling. As with everything surrounding this topic, and you’ve surely guessed it by now, there are various classes of targeted drugs with different modes of action that can be used to treat cancers. Trastuzumab, marketed as Herceptin®, is a targeted therapy used to treat HER2 positive cancers (Berns et al., 2007). It is a monoclonal antibody therapy (MAb), and works just as you’d expect an antibody from your immune system to. 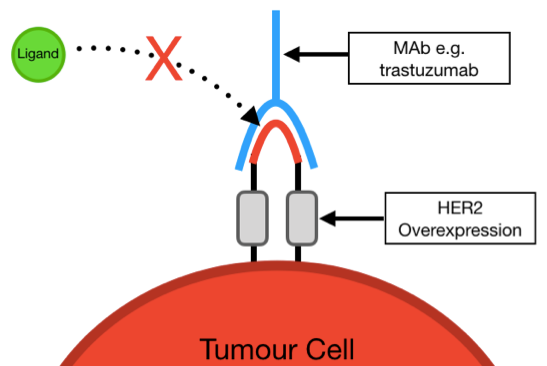 Trastuzumab binds to HER2 and competitively inhibits the binding of ligands to prevent activation of signalling cascades (figure 7). As a result, the levels of signalling are decreased aiming to regain control of cell growth. Given the complex nature of RTK signalling and our ability to intersect at various points, it is no wonder that these networks have been subject to exploitation for drug development, in attempt to regain control. The above only provides a short snippet of events occurring on an enormous scale, with many types of cancer caused by different RTKs, each with many drugs to target them. Through targeted drugs and their enhancement however, we hope to gain the upper hand in the fight against cancer. Arkhipov, A., Shan, Y., Kim, E., Dror, R. and Shaw, D. (2013). Her2 activation mechanism reflects evolutionary preservation of asymmetric ectodomain dimers in the human EGFR family. eLife, (1). Berns, K., Horlings, H., Hennessy, B., Madiredjo, M., Hijmans, E., Beelen, K., Linn, S., Gonzalez-Angulo, A., Stemke-Hale, K., Hauptmann, M., Beijersbergen, R., Mills, G., van de Vijver, M. and Bernards, R. (2007). A Functional Genetic Approach Identifies the PI3K Pathway as a Major Determinant of Trastuzumab Resistance in Breast Cancer. Cancer Cell, 12, pp.395-402. Blume-Jensen, P. and Hunter, T. (2001). Oncogenic Kinase Signalling. Nature, 411, pp.355-365. Moasser, M. (2007). 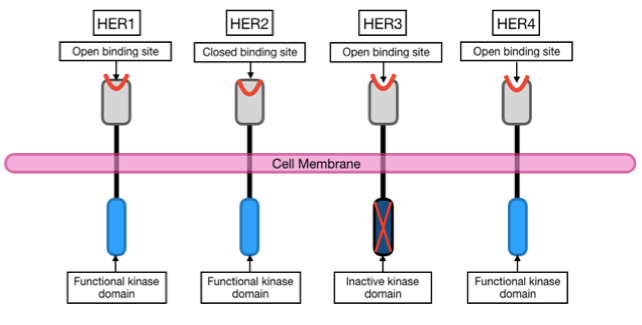 The oncogene HER2: its signaling and transforming functions and its role in human cancer pathogenesis. Oncogene, 26, pp.6469-6487. Normanno, N., De Luca, A., Bianco, C., Strizzi, L., Mancino, M., Maiello, M., Carotenuto, A., De Feo, G., Caponigro, F. and Salomon, D. (2006). Epidermal growth factor receptor (EGFR) signaling in cancer. Gene, 366, pp.2-16. Paul, M. and Mukhopadhyay, A. (2004). Tyrosine kinase – Role and significance in Cancer. Int J Med Sci, pp.101-115. Schlessinger, J. (2000). Cell Signaling by Receptor Tyrosine Kinases. Cell, 103, pp.211-225. Xu, Z., Zhang, Y., Li, N., Liu, P., Gao, L., Gao, X. and Tie, X. (2017). Efficacy and safety of lapatinib and trastuzumab for HER2-positive breast cancer: a systematic review and meta-analysis of randomised controlled trials. BMJ Open, 7, p.e013053. ← Sustainable healthcare – how can it be achieved?